Jane's Emotitats and Sequin Share a Tat have both been in my in-basket for quite awhile, so I finally took care of that. 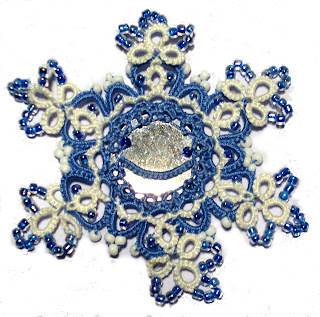 The pattern for the snowflake part can be found here. Combining the emotitat and Jane's first round for the sequin is left as an exercise for the reader. That means I forgot to write it down, but it seemed pretty simple at the time. If you try it, be sure to allow an extra big smile, since the rim around the sequin gets stretched when you add the second round. I haven’t measured the amount of thread needed, but it’s not much. Of course, you can use any colors, but I will use green and yellow in the instructions to go along with my picture. 2 shuttles CTM with yellow thread, 1 shuttle with green thread. Tie the green thread to the yellow between the shuttles. Body: with the green shuttle in your hand as the core thread and one of the yellow shuttles positioned to make a chain, place a paper clip on the core thread to hold a very small picot at the beginning. Now pull the core thread so the tension will curve the chain a bit. 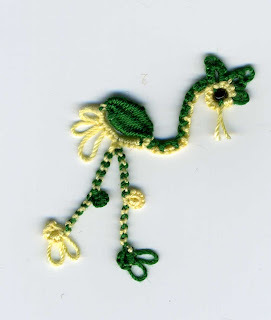 Wind the yellow thread around your thread to make the cluny loom and weave a cluny with the green thread, about 16 passes. After closing the cluny, use the yellow shuttle to lock join to the paper clip vsp at the beginning. Neck: Now make a pearl tatted chain, with the green as the upper thread, one yellow shuttle as the core thread , and the other yellow shuttle as the lower thread. Pearl Ch: [ 1U:2D ] 3 times, [ 1U:1D ] twice, [ 2U:1D ] 3 times. (U=”Up”=number of ds with the upper thread, D=”Down”: number of ds with the lower thread) Pull on the core thread to encourage an S curve in the neck. Head: Make a split ring with the two yellow shuttles, and use the green shuttle for daisy picots. Put a bead in the center of the split ring. Seed beads are good for size 30, 3mm for size 20. R: 1 -- 1 -- 3 clr. Cut and tie.